For four consecutive years since 2001, we topped the charts. Well, as Transparency International Bangladesh (TIB) puts it, corruption in Bangladesh has been "perceived" to be the highest in the world during this period." Our very own national airline, Biman, is a testament to this perception. Since it was formed just after liberation in 1972, the magnitude of corruption never reached anywhere near what it had during the last 5 years. It was during the Ershad regime that Biman was taken for a ride for the first time. The then operational Fokker F-27s were overhauled and refurbished at hefty cost, and were soon sold off at rates far lower than average for the type at the time. And then the poet-president went shopping to UK in 1989, and bought 2 British Aerospace ATPs for the airline at $ 14 million each -- a price which no other airline ever paid for the aircraft type. Seemingly "haunted" by the corruption behind the purchase, the ATPs went on to have a horrendous service record with Biman, and were finally sold to the UK-based Emerald Airways in 2004. In their 14 years with Biman, the ATPs barely took to the skies, and yet spares for the aircraft were purchased by both AL and BNP governments, allegedly amounting to about 75 crore taka. In its regime between 1991-1996, the BNP government bought 2 Airbus A310-300 aircraft from Airbus Industries. While I do believe that the choice of the aircraft type was right (compared to the similar B767 aircraft from Boeing), the price paid was again the highest by any airline. These two aircraft were shown bought at list prices of the manufacturer, and in the world of commercial aviation almost zero-percent aircraft sales are conducted at list prices. The discounts offered by manufacturers range between 5 and 25 percent, depending on the customer, order value, and delivery schedule. As an early customer for the type, Biman ought to have had at least 15% off the list prices - an amount never accounted for in the books, because it made its way into the deep pockets of those who were involved in the deal from within the government and Biman's management. Awami League picked up the baton of corruption from BNP when it came to power in 1996. 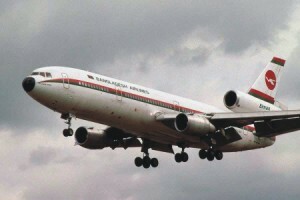 Two McDonnell Douglas DC-10-30 aircraft were leased through Pegasus Aviation at rates approximately 25% higher than prevailing rates at the time. Two Airbus A310s were also dry-leased, at rates of $ 290,000 and $ 330,000 per month, whereas the average monthly dry-lease rate for the type since 1994 never went above $ 250,000. On an average $ 60,000 per month was plundered from these two A310s. Engineer Mosharraf Hossain, the then minister for civil aviation and tourism, was flying high. I would not be contradicted by many, if at all, for saying that the worst thing(s) that has ever happened to Biman are Mir Mohammad Nasiruddin and Shamim Eskander. The former is an uncouth character, with the aura of corruption beaming from every inch of his being. The latter is the younger brother of Begum Khaleda Zia, infamous for single-handedly leading the looting in Biman over the last 5 years. The lease of 2 Boeing 737-300s from Singapore-based Regionair involved corruption of about $ 3 million, based on the prevailing global wet-lease rates for the aircraft at the time. One A310 was leased from US-based Crane Aviation at outrageously high rates, at the persistence of Eskander. Two Fokker F-28 aircraft, actually meant for scrapping in Indonesia, were bought for $ 2.9 million. If they were not taken up by Biman, they would have been turned into beer cans. Hmm! From his professional designation of Flight Engineer at Biman, Shamim Eskander actually "engineered" more than just flights. Apart from the occasional aircraft lease deals, he unleashed his shameless greed day-in and day-out at Biman throughout the last 5 years. For example, spares worth about $ 200 were brought at $ 7,000, or ones worth $ 12,000 at $ 55,000. Thousands of such purchases were made, often deliberately forcing an Aircraft-on-Ground (AOG) situation, to take advantage of the liberal purchase regulations, which were meant for true emergencies. He used his brother-in-law Shahedul Huq's company as the tool, while Nasiruddin used his close aide Farhad (an automobile spares supplier in the grey market), to plunder millions of dollars from Biman's spares purchases and maintenance, repair, and overhaul deals. Years of unending corruption in Biman reached its peak between 2001-2006. Its losses in 2006 neared $ 42 million -- while the minister, many senior and middle management officials, and even some cabin crew, were rolling in wealth at the expense of Biman and, thus, the nation. A recent newspaper report stated that Biman owes about 1,500 crore taka to Bangladesh Petroleum Corporation (BPC), and another 1,000 crore taka as outstation bills and payables to international organizations. I have spoken to a number of Biman's current officials, like Captain SM Nasimul Huq (ex-president of Bangladesh Airline Pilots' Association), and read articles on Biman by Captain A Muqeet, Bir Pratik (ex- president of BAPA and Regional Vice-President of International Federation of Airline Pilots' Association) which has led me to believe that, if it was not for corruption, Biman could have well been a strong and sustainable airline. Most of the information I mentioned in this article has been reported in different media over the years. And the point that I am trying to make is that, if all the corrupt who "raped" Biman through the years are taken to task, and even half of the taxpayers' money these people have plundered could be recovered from their possession, Biman would be a pretty wealthy organization in no time at all! I would like to, hereby, urge the combined body of Biman's trade unions -- the Biman Sammilito Sangram Parishad (BSSP) -- to file a graft allegation at the Anti-Corruption Commission, and demand trials of all those who have mercilessly clipped the wings of our pride. The author, currently an aviation industry consultant, has previously worked on projects with The Boeing Company, Honeywell Aerospace, and FAA's Operational Evolution Plan (OEP) in 2004-2005.